One way to make learning letters fun for toddlers is through play. Another is through music. Now, playtime hits a high note with the ABC Musical Train. 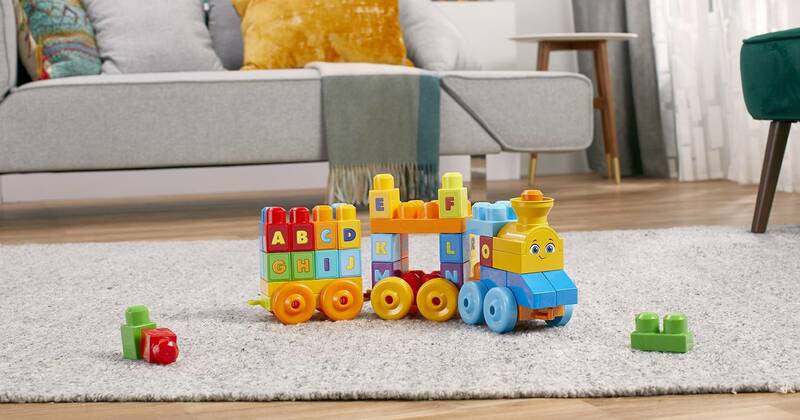 From alphabet building blocks to exciting musical surprises, this buildable toy train will have your preschooler on the fast track to learning! Made just for little hands, it’s easy for toddlers to bring this friendly train to life when they connect the 3 rolling wheelbases then stack the big colorful blocks on top. Don’t forget the smokestack! And, with blocks featuring the letters A through Z, little ones can learn their ABCs as they stack the letters in order all along the train. Or, mix them up for all kinds of silly alphabet combinations – all while practicing fine motor skills. Then, chuff ahead to new adventures with sounds and songs that surprise and delight! Sensory play is a big part of how toddlers develop curiosity and discover the world around them. Just press on the smokestack and listen for the adorable melodies and real train sounds! From alphabet fun to motor skills and sensory development, the ABC Musical Train is ready to take your little one to the next stop on their learning journey. All aboard! The ABC Muical Train is coming soon to a retailer near you! Choo! Choo!